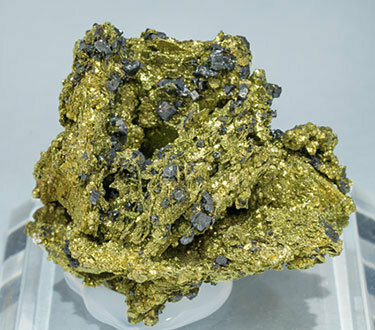 Aggregate of very bright Chalcopyrite crystals, pseudomorphous after Polybasite with a hexagonal contour and partially coated by small cubic Acanthite crystals. Group of very sharp laminar crystals with very marked triangular growth figures on the pinacoid faces. 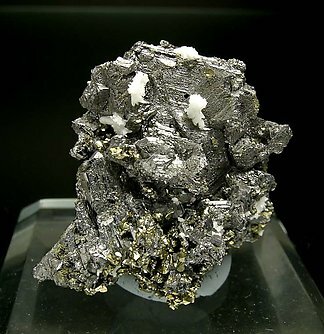 Chalcopyrite growths and small white crystals of Quartz enhance the esthetics of the specimen. The specimen is accompanied by a Lidstrom’s label, and we will give the buyer also a copy of the analysis of the Polybasite. Excellent miniature. 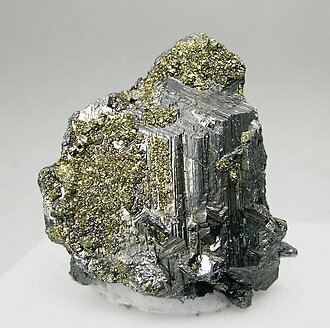 A group of tabular crystals partially coated by Pyrite. The sample is from the Folch collection where it was labeled as Pearceite. We did an analysis, that we’ll send to the buyer, and the result was clearly Polybasite.